Ever looked at an icicle dangling from your roof and thought to yourself, “Man, I’d love to wear that on my wrist”? No? Just us? Well, you might have a change of heart after feasting your eyes on the Hublot Big Bang Unico Sapphire, a crystal-clear stunner of a timepiece constructed largely from sapphire. The case middle, back and bezel are all cut straight from blocks of sapphire — nearly as hard and scratch-resistant as diamond, it’s long been one of the world’s hardest materials to manipulate. The skeleton dial, meanwhile, is crafted from transparent resin that beautifully displays the watch’s Unico HUM1242 movement. 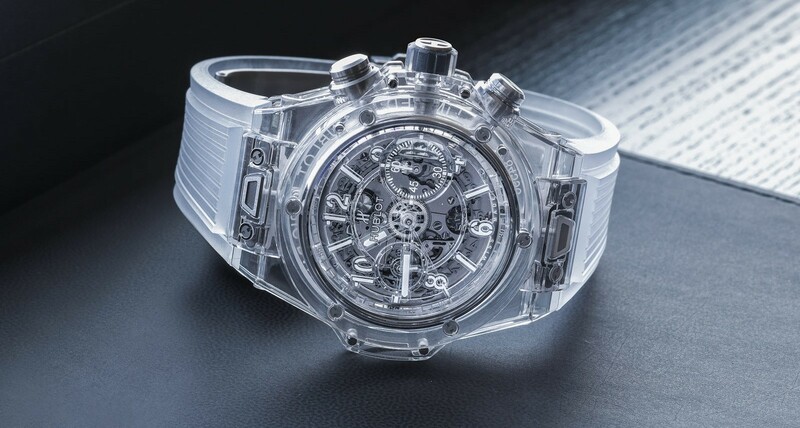 And, finally, in keeping with the overall icy aesthetic, it’s finished off with an incredibly cool transparent strap. Only 500 of these babies were produced, so get ’em while they’re hot… errr… cold.